There are still plenty of people who think they’re doing themselves a favour by using artificial sweeteners, but plenty of research appears to indicate that this is far from the case. Anything which professes 1 to be a healthy alternative to table sugar and high fructose corn syrup but which, in reality, actually increases the progression of serious chronic illness 2 would be a bitter pill to swallow for those with a sweet tooth. 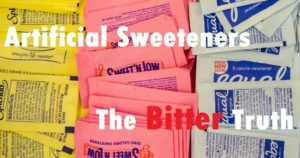 Whichever artificial sweetener you’re using – saccharin (Sweet & Low), sucralose (Splenda), or aspartame (NutraSweet) – it appears that the manufacturers’ claims, that they are harmless sugar substitutes providing the sweet taste without the calories or spikes in blood sugar, are unfounded. And not only that, these products seem to produce even worse health problems than normal table sugar. What if you stop using artificial sweeteners? When the immediate physiological responses to the intake of the likes of sucralose are tested in the lab, the results 8 9 show a significant blood sugar spike in response to a glucose tolerance test. This means that more insulin is produced (around 20% more) and this, in turn, can lead to insulin resistance. This would explain why consumption of artificial sweeteners is linked to increased rates of the above chronic diseases. Normal table sugar (sucrose) and other natural sugars are converted into glucose and absorbed into the bloodstream while passing through the stomach and small intestine. The producers of sucralose etc claim 1 that they are supposed to be relatively inert substances that passes through the intestinal tract and out of the body without being absorbed. Well, this might be the case in terms of absorption in the stomach and small intestine, but when these chemicals end up in the large intestine (colon), that’s when the trouble begins. Research has shown 10 11 that, upon arriving in the colon, sucralose, saccharin and aspartame (as well as another artificial sweeteners called acesulfame K 12 ) all exert a negative effect on our microbiota, also called gut flora – the billions of microbes living in our guts. 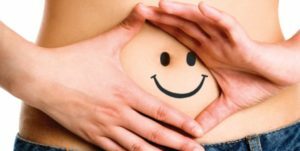 In previous blogs 13 14 15 16 17 18 , we’ve seen the wide-reaching influence of our gut bacteria on pretty much all aspects of our health. Additional studies on both rats 19 and humans 20 have found that the changes to the microbiota caused by consumption of artificial sweeteners induces glucose intolerance. So, it came as quite a shock to some 21 that substances introduced to help solve the problems associated with obesity are actually having quite the opposite effect by producing unhealthy microbial alternations. Researchers found 22 , for instance, that each molecule of aspartame is metabolised into formaldehyde, not a substance you want inside your body 23 24 25 . Regarding aspartame, all studies funded by the artificial sweetener industry show that it’s perfectly safe . However, 92% of independently funded studies 26 found that aspartame produces adverse health effects. However, it may not be made clear to these individuals that research shows 21 artificial sweeteners can exacerbate their already unpleasant symptoms by negatively affecting their gut bacteria. Canada was the first country to approve the use of sucralose. IBD rates doubled after sucralose was approved 28 . 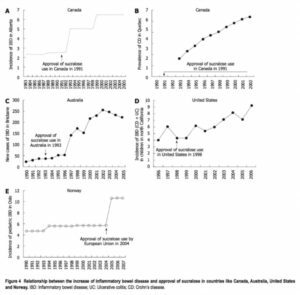 In the United States, after decades of relatively stable rates of ulcerative colitis and Crohn’s disease, rates started rising after artificial sweeteners were introduced 29 30 . In China, IBD rates rose by 1200% after sucralose was introduced 31 . Similar related increases have been found in Norway, Europe and Australia 31 32 . There needs to be a lot more research on stevia, a sugar substitute extracted from the leaves of the plant species Stevia rebaudiana. Dr Greger considers 33 that its unwelcome ability to cause a big spike in mutagenic DNA damage 34 in rats should not be of great concern if you have only two beverages per day sweetened with stevia. 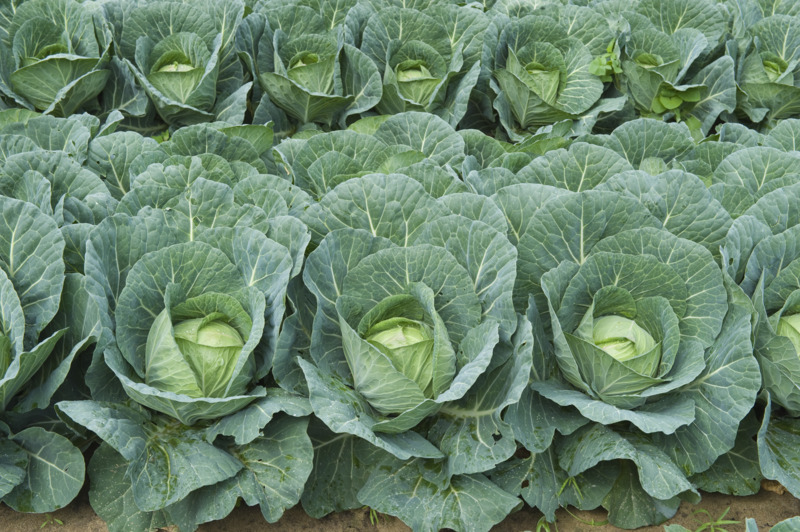 Above this quantity, there’s evidence that it may cause DNA damage in humans. However, neither Dr Greger nor any other source I can find at the moment gives any clear data on stevia’s effect on insulin spikes. Some research 35 36 37 38 is available if you want to study it further. For my part, I would leave well alone, since there is simply too much uncertainty about its effects on humans over prolonged periods of time. In any event, it is still a sweetener that will help to keep us hooked on that sweet taste – something we should ideally learn to live without for the most part. Research 39 shows that once you stop using artificial sweeteners, the balance of your normal gut bacteria should be restored within just a matter of weeks. It’s not just a matter of avoiding all artificial sweeteners, but of avoiding all added sugars, if possible. 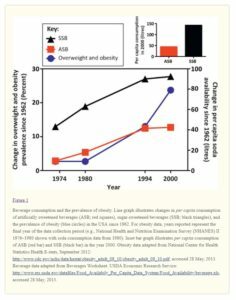 Giving up sucralose to take up sucrose or high fructose corn syrup is not advised 40 if you want to maintain optimal health (as can be seen from the following chart, where SSB = sugar-sweetened beverage and ASB = artificially-sweetened beverage). I know personally that it’s tough to make a change away from sweet foods and drinks once you’ve become used (addicted?) to them. I’ve always had a sweet tooth and getting through a single meal without a sugar hit was almost impossible for me during the majority of my life. However, I’ve found that it’s possible to ditch all added sugars and reeducate the taste buds. Yes, it may take some effort at first, but it’s worth it in the long run and your body will thank you for it 26 .